This book broke my heart. Smashed it into little pieces. Then, little by little, it put it back together. Just not quite the same as how it was before. It’s hard to express how much I loved I’ll Give You the Sun, especially since I never intended to read it. This book is filled with complex, flawed, and vividly ‘real’ characters. The main characters are twins Noah and Jude, but the supporting cast of parents, friends, mentors and love interests are given equally thoughtful treatment. There are some pretty heavy issues throughout this novel, but the more contemporary YA I read the more this seems to be the norm rather than the exception. Death, betrayal, sexuality, infidelity, and personal challenges such as self doubt and ‘fitting in’are all wrapped together into a complex web. One thread which links up the whole story and is very close to my own heart is artistic expression. The book is filled with characters who use art to express themselves, and the pages of my edition were quite literally splattered and dripped with paint, which gave a really personal feel and added to the mood of particular chapters where there were more paint splotches. It is difficult to describe the plot without giving anything away, but the perspective shifts between the twins, at ages 14 and 16. Usually in novels with 2 or more perspectives one voice is stronger than the other, or there is a character whose chapters I can’t wait to end, but this time I loved both equally. The characters experience so much in each section, they grow and change, that it is hard to let them go, but at the same time I couldn’t wait to read about the other. Throughout this novel I was strongly reminded of a quote from another YA contemporary I read this year, Saint Anything by Sarah Dessen: “You get used to people being a certain way; you depend on it. And when they surprise you, for better or worse, it can shake you to your core”. At the beginning of the book the main characters are cast as particular types, with particular relationships to their parents and each-other. Over the course of the book these shift and change, rewriting the relationships and family dynamics, which I think is an excellent portrayal of the shifting sands that we all experience, and shows that you are not your labels. 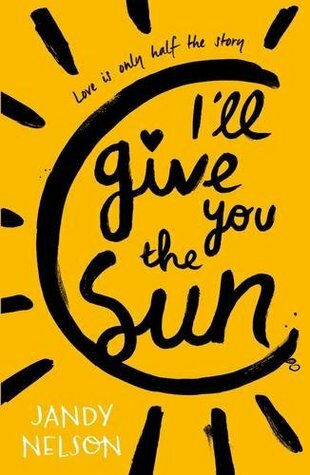 I’ll Give You the Sun is one of those books I have seen everywhere, it seemed like I couldn’t check social media without seeing someone singing its praises. Because of this, I resisted reading it, avoided it, because I’ve been so disappointed in the past by books that are hyped like this one has been. By chance I came across it in a bookstore with a cover I didn’t recognise, and the blurb plus artwork throughout intrigued me. Don’t be put off by the hype, like I almost was. This is a genuinely interesting and engaging novel, that has merits of its own to stand on, beyond its status as the second-most-photographed-YA-novel (the first being Fangirl, of course). This is a YA novel with both brains and heart, and I highly recommend it.